Tony Stark's future in the Marvel Universe has been thrown into doubt ever since the start of Civil War II — and made even more doubtful when we learned that he would be replaced as Iron Man by not one, but two different characters. 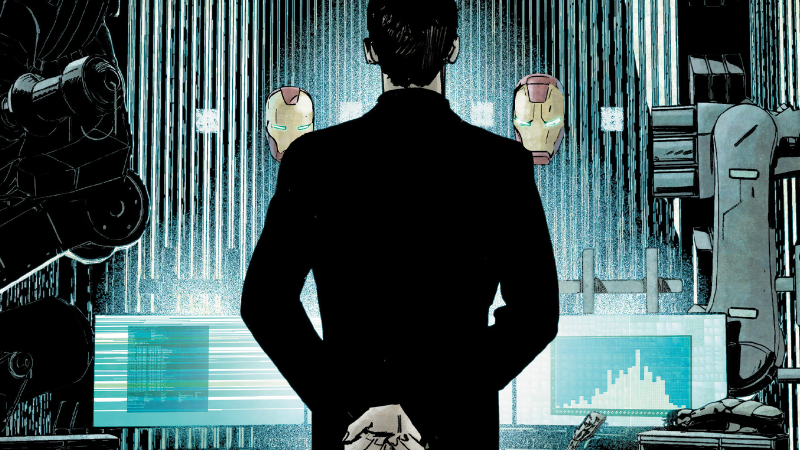 One of those Iron Men debuted today in Infamous Iron Man, giving us a major hint about Tony's fate. 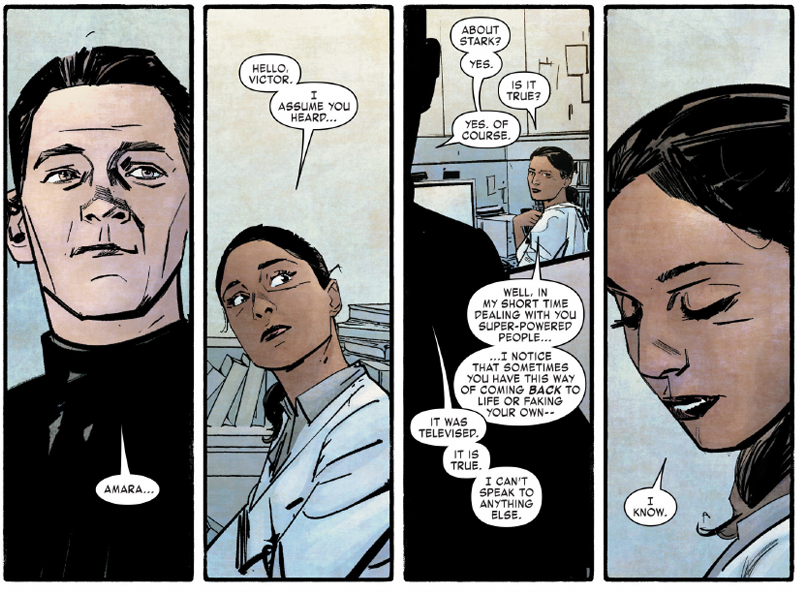 Infamous Iron Man #1, written by Brian Michael Bendis and with art by Alex Maleev and Matthew Hollingsworth, doesn't really do much to tell us the state of Marvel's world after Carol and Tony came to blows over the events of Civil War II. The intro to the book simply teases "dire consequences" for Tony, and the only real hint for much of the first issue that something is awry is the fact that Victor Von Doom — who's been helping Tony deal with saving the newly-refreshed Marvel universe from alternate realities on the sly ever since the start of Invincible Iron Man last year — has chosen to step out of the shadows and take on the mantle of Iron Man for himself. 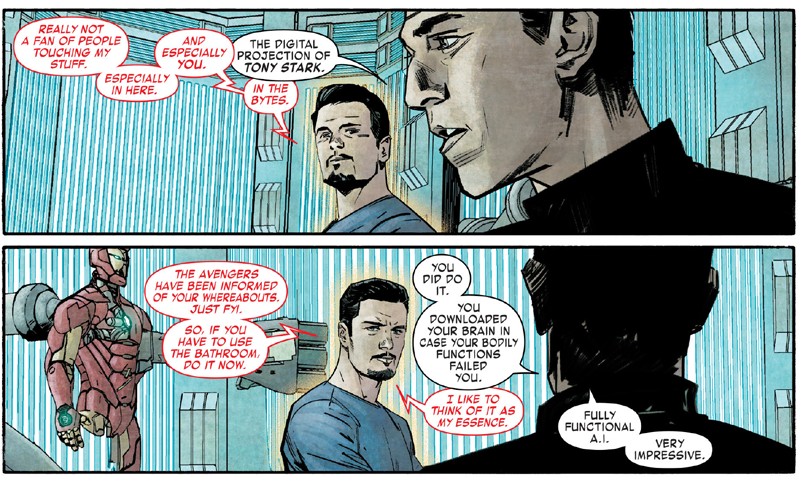 So while Iron Man might perish at the end of Civil War II, Tony Stark lives on — his brain, downloaded as an artificial intelligence, hanging around in secret, presumably trying to find a way he could come back to life or a new body to download his digital "essence" into. It's a lot like what recently happened with Doctor Octopus in Amazing Spider-Man, but instead of a deadly villain's brain floating around after he died, it's one of Earth's Mightiest Heroes. So while Tony Stark isn't really gone, don't expect him back as Iron Man any time soon. Victor jets off in his rad new armour at the end of the issue, to continue what Tony Stark started, and we know that Tony's replacement in Invincible Iron Man, Riri Williams, will be running around with an AI of Tony (maybe even this AI we see in Infamous Iron Man) as Ironheart. But at least now we know, a good few months before it ends, about one of the major bombshells of Civil War II. If he made himself into an AI why didn't he make a New solid iron man suit to download himself into. Because they did that over a year ago in superior ironman.